Fan of aerial photography? You can take amazing shots from above and shoot video from the sky on your own with a drone camera. You don’t have to be a registered pilot to fly one of these drones either. With a budget of around $1,000, you can buy a small drone even beginners can fly. Go Pro Karma is probably one of the most anticipated drone cameras of all time. The Karma is intended to work with Hero 4 and Hero 5 action cameras. There are so many features going on for this little device, as expected from Go Pro. Perhaps the biggest features are the folding arms and the amount of landing gear it comes with. The Karma drone camera is relatively new, so there are only a handful of other products to match the tech specs. When the Karma was initially rolled out, there was a faulty battery issue that delayed the rave reviews. But Go Pro has fixed that issue and Karma stands as one of the best drone cameras money can buy. The Karma drone camera is instantly noticeable for its folding design. The drone’s landing gear and arms can be folded and neatly tucked into the body. This makes the Karma the most portable drone around. It’s very easy to store and transport. The Karma weighs about 2.2 pounds, so you need to register the drone with FAA before flying it. But it’s still one of the smallest drone cameras around. The camera has an internal battery. The Karma has a cool gimbal mounted on the nose that offers good stability. The Karma comes with separate propellers that need to be screwed to the drone before flying. But that won’t take more than a minute. The Karma comes with a carrying case to hold the drone and all its accessories. A well designed remote controller is also provided. There are many features. Mainly, there are four auto flying modes, like “Orbit” that makes the drone fly around the pilot, or the adorable “Dronie” mode that takes selfies and then zooms out. The other two modes, “Reveal” and “Cable Cam” can be used to set the drone on a custom path. But this is not a fully autonomous drone camera. Manual operation is required even with the flight modes. The Karma comes with virtual flight simulator environment software to practice flying. It’s really fun, and very useful to first-time drone pilots. The Karma unfortunately doesn’t come with an LTE connection to access apps like Google Maps. But you can download maps directly to the Karma by searching for area names or ZIP codes. Video quality of Go Pro Karma is quite adequate considering its size and price. It can shoot amazing 4k video at 30 fps (or lower). The camera has an ultra-wide field of view to shoot vast, panoramic landscape shots. However, the field of view becomes tighter at lower resolutions. The camera supports lower resolutions down from 2.7k at frame rates as fast as 120 fps. The Karma can shoot video and take photos from long distances like 3km (about 1.8 miles) in the air. Even at the max distance, video quality is top notch. The videos retain vibrant colors, fine details, and have rather broad dynamic ranges. Thanks to the gimbal, the footage is stabilized and there’s no shaking. Because of the stabilization, video shot using this camera looks almost professional. Performance wise, this is easy to fly once you complete the flight simulator. It’s ready to fly as soon as the user sets up a Go Pro account. The drone flies without stability issues. It can reach speeds as high as 35mph. The drone comes with a geo fence feature so the user can prevent it from staying away. Be careful that in some urban settings, competing Wi-Fi networks can make the Karma confused. In remote areas without many homes, the drone works fine. The internal battery life of the Karma lasts only about 17 minutes in the air. Mostly it averages around 15 minutes. This is really poor compared to other models that cost similarly. Go Pro Karma is definitely one of the best drone cameras you can purchase. It can shoot video in 4k/30fps and at lower resolutions with fps as fast as 120. The drone is really easy to operate. It has a really impressive stabilizing gimbal that keeps the video looking professional. It’s not perfect, as the disappointing battery life shows. Yet, this is definitely one of the best products currently available. When it comes to drone cameras, DJI Mavic Pro is almost peerless. Only the Go Pro Karma comes close to the functionality and quality this drone camera offers. It’s portable and highly compact. It comes packed with a number of features too. The Mavic Pro is possibly the most features packed drone camera available right now. It’s great, of course, but it will cost you a bit too. If you are serious about taking aerial photography, then the price is well worth paying. The Mavic Pro is one of the best designed drones available in the market. It, in fact, has a Red Dot award for the design. It’s designed to be very sturdy. This drone has really tough hulls that even the Go Pro Karma doesn’t have. It can handle one or two crashes (on to soft grass) for certain. One feature the Karma has an advantage over the Mavic Pro is the gimbal. The three axis gimbal is compact, but is held in place flimsily by rubber bands. These bands can snap if you are not careful. There are just too many features on the Mavic Pro to provide full details. The main feature is definitely its portability. Also, the compact controller makes navigation easy, without having to carry around a massive remote that looks like a flight control station. This drone comes with Optical Flow and ActiveTrack software from DJI. These programs allow the drone pilot to sense obstacles in advance and track various objects for better focusing. The Mavic Pro is also equipped with OcuSync video transmission system. OcuSync extends the drone’s range to over 4 miles, which is insane. There are not other drones on the market at this price range that has a range this long. Also, OcuSync allows shooting of 1080p Full HD video at closer ranges. The Mavic Pro’s video quality is nothing short of impressive. The camera can shoot video at 4k resolutions max, and take 12.7 photographs. The field of view, however, is slightly narrow at just 79 degrees. The camera comes with great software that enable features like exposure bracketing and burst shooting. The frame rates on the Mavic Pro can go as fast as 120 fps. At max 4k, fps is limited to 30, which is standard. One problem with the camera is the stabilization. Because the axis gimbal is designed badly as mentioned above, footage can get shaky if you are not careful. The Mavic Pro is one of the easiest quadcopter drones to fly. It has decently powerful motors that guarantee speed and agility. Theoretically, this drone can reach a speed of 40 miles per hour. Some testers have shown that this drone can go as fast as 50 miles per hour too. It can sprint to complete 100 meters just 5.3 seconds. So as far as flight performance goes, even the Karma can’t beat the Mavic Pro. The battery life is impressive too. Despite being a compact drone, the Mavic Pro packs a battery big enough to enable flight times close to 30 minutes. It can hover in the air for 24 minutes straight. On the energy saving mode, the Mavic can stay airborne up to 27 minutes. These numbers are most impressive. Arguably, the DJI Mavic Pro is one of the best drone cameras to own. It comes with a hefty price tag, but can shoot 4k and Full HD video with a maximum range of 4 miles. It comes with a number of features including many flight modes and image processing software. The cons for the model are also minimal. If you are a serious drone or aerial photography enthusiast, then the Mavic Pro is a must have drone camera. 3D Robotics Solo is the best known drone from the brand. This drone comes with a lot of software available for download. If you are into SDKs, this is one of the best drones to own. It packs a number of desirable features to make this one of the best drones to buy. The Solo drone is very minimalistically designed, unlike most drones. It’s very angular and has a black plastic exterior. The 5,200mAh battery attached to the top of the body, not internally, near the power button. This, however, does not affect flying. For a quadcopter, the Solo drone is large and quite heavy too. It weighs 3.35 pounds. You will have to register this drone with the FAA to fly. If you think this drone is drab, it does come with a number of LED indicators on the body. It can light up like a Christmas tree at night. The Solo drone comes with gimbal accessories and a Go Pro action camera. This drone does require more add-ons than the Karma or the Mavic Pro. Solo’s main feature is its software. The preinstalled programs are easy to use and are also easy to customize. This is an autonomous drone, so there’s plenty of room to experiment too. The Solo comes with a large controller that has an OLED screen. It has two joysticks that makes flying this drone real fun. The Solo drone cannot take photos and video on its own. A frame is provided to add a Go Pro camera to shoot video and photos. The camera connects to the drone via an HDMI cable. The drone is connected to a controlling app that stored video feedback. 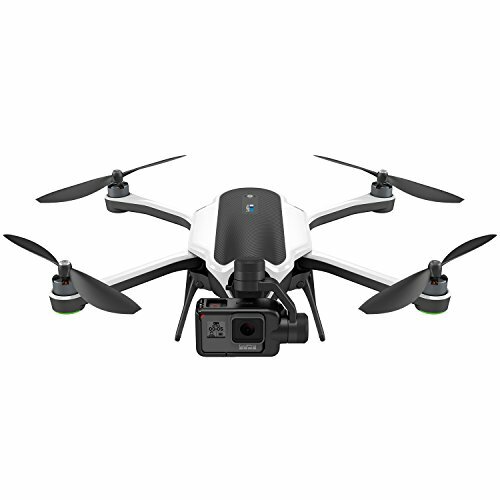 You can use a Go Pro 4 or an older Go Pro 3 camera with this drone. With a Go Pro Hero Black, for example, you will be able to shoot 4k video at 60 fps. That’s professional grade footage. The Solo is a strong flyer. It’s easy to control thanks to the large but useful controller station. Even beginners can become pro drone pilots with this. Flying this drone is a lot like playing a video game, so everyone can try it without being intimidated. This is a drone that can fly autonomously, which is very rare for drones of this size and price range. This ability is built into the drone, and not the controller or the corresponding drone app. There’s only one auto flying mode called Orbit. 3D Robotics Solo is a great drone with many perks. The main drawback is that this drone doesn’t have a camera attached, so you will have to attach a GoPro to the frame provided. The biggest perks this drone offers is autonomous flying and a host of software that makes flying and shooting video fun and easy. Cheerson Hobby CX-20 Professional is not a super fancy drone like Go Pro Karma or DJI Mavic Pro. But it is definitely one of the most affordable and easy to fly drones. 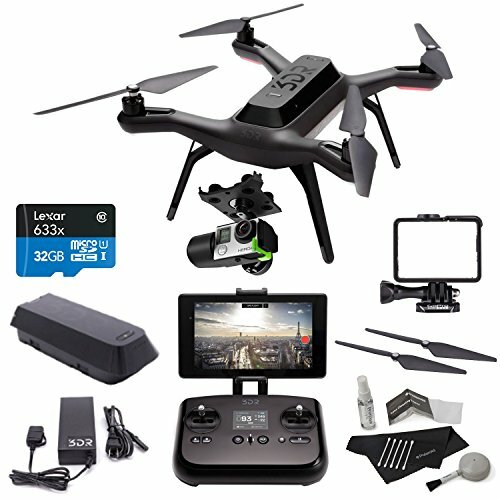 If you are looking for a starter drone that you can buy without breaking the bank, then this is one of the best choices around. 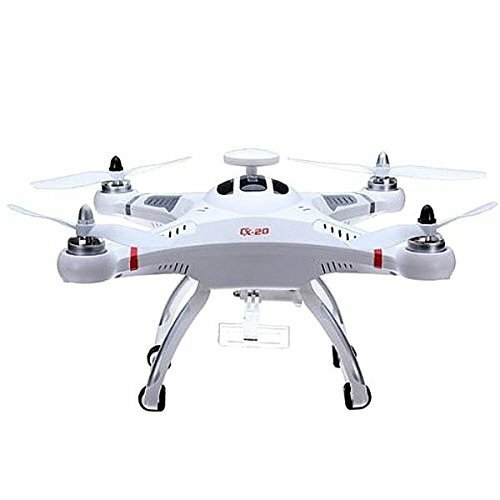 The Hobby CX-20 Professional is a small, all white quadcopter. It looks stunning when on the ground. However, the white exterior can make the drone look almost invisible when flying during the daytime. This drone comes completely disassembled, so you will have to spend some time assembling all the parts. It’s not that hard if you follow all the instructions provided in the manual. For a small and rather affordable quadcopter, this drone is designed to be very stable. Because it’s small, you don’t need to register with the FAA before flying. One disadvantage is that the smallness makes this drone easy to get caught in the wind. It comes with a nice battery compartment cover for securing the internal battery. The body of the quad also has a number of LED lights that makes nighttime flying very colorful. The main feature of the Hobby CX-20 Professional is the Intelligent Orientation Control. This is a semi-auto feature that helps the user keep the drone always under control without risking it staying away. IOC allows the drone pilot to pull the drone in his or her direction. If the drone goes into a spin, IOC makes it easy to get under control. Beginner drone pilots will find this feature highly useful. The Hobby CX-20 Professional is designed for aerial filming, but doesn’t come with its own camera. Instead there’s a camera mount to equip any camera you want. This model is most compatible with Go Pro cameras like 3 and 4. It’s also compatible with Amkov Amk 5000 sports camera. You can definitely shoot 4k or Full HD video as long as you can find a supporting camera. The flight performance of Hobby CX-20 Professional is truly fantastic. It can go up to 300 meters in the air, which is respectable for a quadcopter of this size and price range. It can reach flight speeds up to 22mph, which makes this drone one of the fastest small drones. It has a return home function, that makes flying super convenient. This drone has some autonomous functions. Namely, the drone can hover on its own, hold a certain altitude, and automatically land safely. Flight time is about 15 minutes on a 2700mAH battery, which is quite decent. This is as much flight time as the much more expensive Go Pro Karma. The Cheerson Hobby CX-20 Professional is one of the most convenient drones to buy. If you equip this with an HD camera that fits, you will have a really decent aerial photographer. Considering that this drone is rather affordable, it offers great features like easy flying mode, decent flying time, and durability. 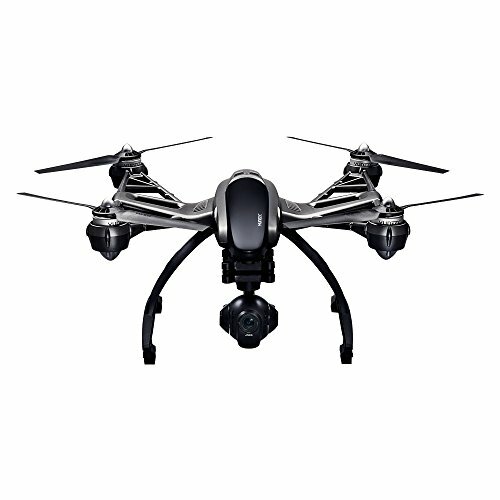 Yuneec Q500 4K Typhoon is an affordable box-shaped drone that is intended for consumer use. However, unlike most other budget consumer drones, this one doesn’t come with a camera mount. It has an in-built camera that is actually decent. If you don’t want to spend over $1,000 for a drone camera, but still want 4k video, then this is the product to consider. Make no mistake, the Yuneec Q500 is a big drone. But it’s not too humongous to be inaccessible to beginner drone pilots. It’s smaller than the DJI Phantom 3, but is not small enough to fit into a backpack. The drone comes with a nice travel case to pack all the accessories. It’s designed with a neck strap and a sunshield to. The drone comes with a SteadyGrip handheld mount and a car charger. This drone is remote controlled, of course, and it’s called the Wizard remote controller. It remote is a lot like a TV remote. Instead of the joysticks you find with most drone cameras, this remote allows controlling the drones with simple gestures. The remote has its own GPS and a touchscreen display, which are huge perks. This drone isn’t feature packed as the DJI Mavic Pro, but for the price range it offers an excellent number of features. The drone has a geo fence barrier to prevent it from straying more than 300 feet from the controller. It has two Smart Mode semi auto flying modes as well. The pilot can see everything on the fixed screen on the remote. The disadvantage is that the footage cannot be transferred to a bigger screen. Also, this drone lacks waypoint navigation. One big plus is the three-axis gimbal, which keeps the drone camera amazingly steady. The footage is kept steady too and there is no “jell-o” effect when shooting. The Yuneec Q500 comes with a really cool camera for a small semi-budget drone. The in-built camera can shoot Ultra HD 4k video at 30 fps. This is close to what expensive Go Pros and DJIs can too. It can shoot Full HD video at an incredible 120 fps. All recordings are done in 50Mbps, which captures details wonderfully. The footage is really sharp and looks superb. This drone camera is relatively easy to fly, but you will have to get used to the Wizard controller. It may take a while, but it’s not impossible for beginners. There is no automatic takeoff or landing, and those are the hardest parts to master. But thanks to the gimbal, this drone is really stable, which makes flying rather easy. This drone can stay airborne for about 20 minutes maximum. When the battery is low, the controller will issue a warning to land. 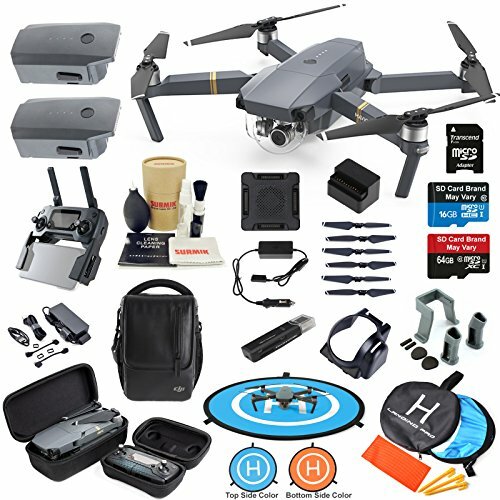 The Yuneec Typhoon Q500 4K is an amazing drone that is far cheaper than the Go Pro Karma or the DJI Mavic Pro, but delivers similar types of performance. You can shoot 4k or Full HD video in amazing detail without a fuss. You can buy a drone camera with an in-built camera, or with just a mount to fix your own camera. You can buy a drone for relatively cheap and equip a Go Pro camera to shoot 4k video.Always buy a drone camera with a separate controller. The touchscreen controls that drone apps offer on smartphones are flimsy, inaccurate and can frustrate even the most patient people. Decide on a budget before you buy your drone camera. That way you can purchase the best product suited for your price range. Before you make your purchase, carefully weigh the pros and cons given in the above reviews to make the best choice for your budget.